My lips have not graced the smooth cool rim of an actual glass while drinking a beverage in a very long time. Since Mardi Gras, in fact. Well, save for the occasional cup of hot tea, or coffee, which is a fairly rare occurrence between late May and sometime in mid-October. 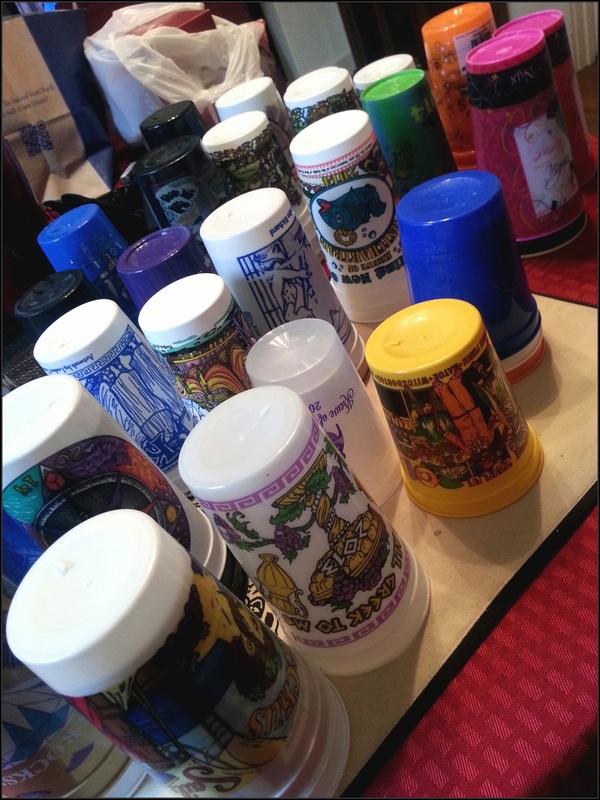 See, not only was one of our Mardi Gras missions this year to See Every Parade that Passes By the House (and nearly killing ourselves in the process), but we also had the similarly self-destructive goal of Collecting Cups from every Krewe that would throw one at us. And it was just about every Krewe that threw one at us. Or two. Or a clump of six. 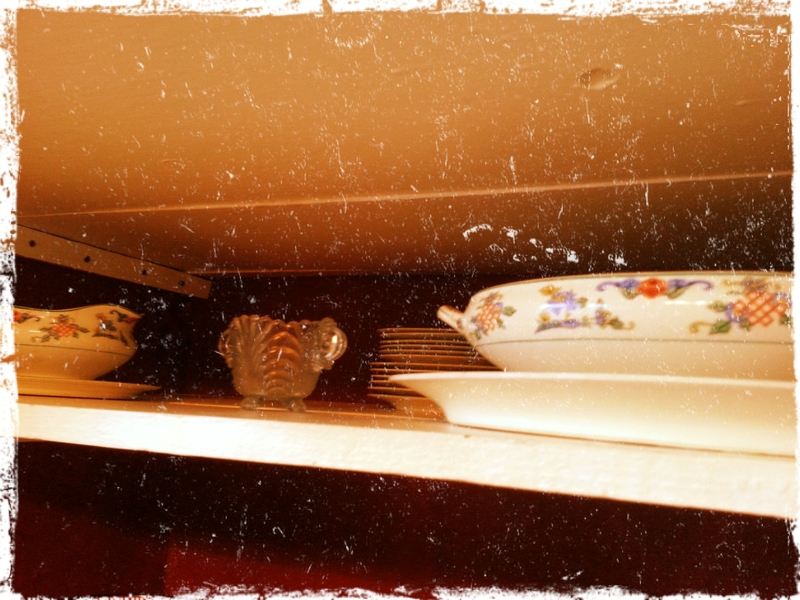 We have now amassed, within our first year of living here, our own beginnings of what we all love to call the New Orleans China. The fine china, no less. No, not the china you inherit from your parents via a grandparent and carry around with you from college on, losing the sporadic piece to the doom of time or the smash-and-shatter of a dropped box during one of a gozillion moves. This is my actual fine china, of the variety precisely described above. Rather, what we are now overrun with are the Go-Cups. The plastic divinities with the krewe names and parade years lovingly printed on each and every one. 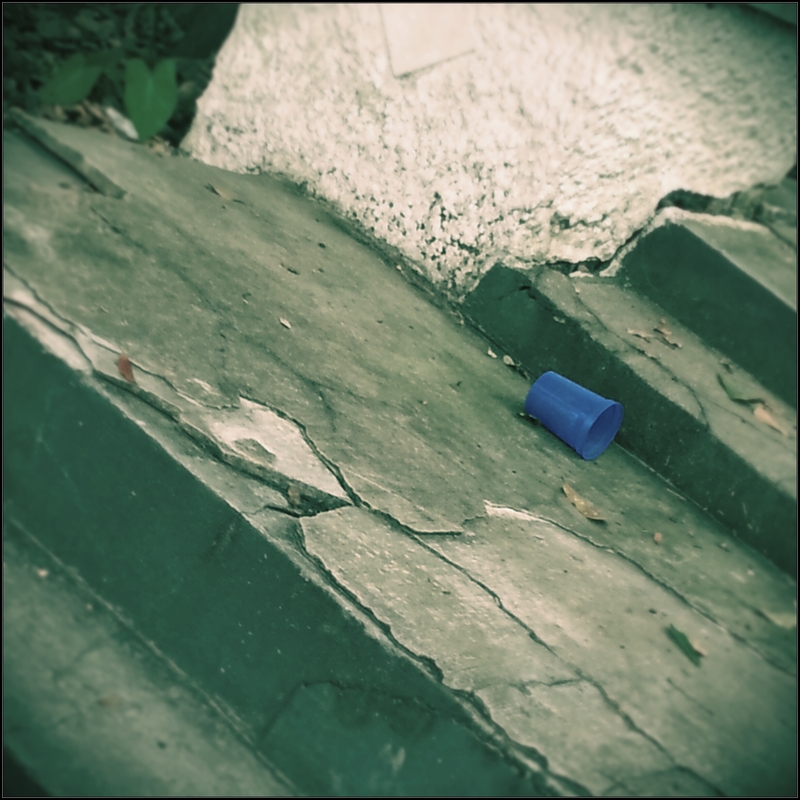 A smattering of these items should be, and likely are, a major part of every New Orleanian survival kit – second only to the can of mace or the rest of the hurricane supply box – this handy dandy Plastic Cup, which allows you to legally wander the streets with an adult beverage in your hand. We don’t actually use them for that, us. One of my coworkers does – he catches these things at parades solely to keep something on hand to walk to the bar with. A little bit of pre-party, as it were, he’s lived here for over 15 years and is comfortable with tossing them once he’s reached his destination. And I confess to their handiness on further parade days: “Hey! I can use that swell GIGANTIC Tucks cup with the straw longer than my forearm to mix something fun up for the next parade – it’s big enough that I won’t have to run home to refill!” I hate missing anything during a parade, so the ability to camp out for 5 hours without having to step away is ideal. Thank you, Tucks. Overall, though…I take my morning pills with a cold glass of water from Chaos. I pull a swig or two of milk (when I’m not doing it directly from the carton) with a little help from the Muses. Or I grab the tall ones from Orpheus for water during my morning workouts. Or from Proteus. Or Freret. Or whoever happens to be in the front of the cabinet. But I always, always drink my wine out of the holographic Nyx cup. Unless it’s in the wash, like tonight. J reorganized this the other day. Before they were all up top, they were on the bottom, in FRONT of the real glasses, hence the lack of access to permanence. However, I’ve noted, we both still tend to reach for these damn plastic cups, even though they are now contained and out of reach. I think that being a New Orleanian requires at least some small leaning toward hoarder tendencies. 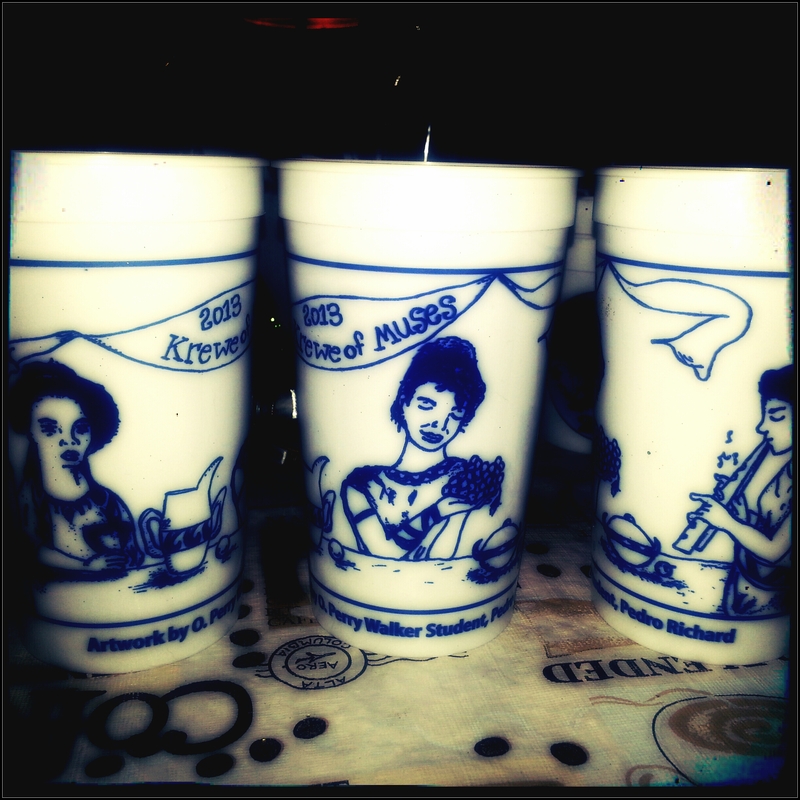 Why else would we be so infatuated by these cups every year? (Or the beads. Or the footballs or the stuffed animals or the..well, you get it.) In my head, I keep trying to weed these cups out, and keep the favorite ones. I’ll never forget how excited we were when we brought our first cups home. I mean, EXCITED. 2013. We were so elated to have procured THREE, so that we could take a picture showing all three cup angles. Then, there’s not just Mardi Gras but Halloween. And Christmas. And Juan’s Flying Burrito up the street. We have cups for all of those, too. …and reflexively wondered how MY King Arthur cup got THERE. That’s the grandest thing about this collection: no matter whose house you go to or which porch you’re drinking on, you’re likely to be swilling from the same cup you have in your own crowded cabinet. I had a similar feeling a few weeks ago when we were at a friend’s housewarming party. I didn’t know many people there at all and was feeling kind of awkward and shy and then I glanced at a table overrun with purses and phones and cigarettes and beer cans and right in the middle, like a gleaming beacon of hope, was a yellow Zulu cup from Mardi Gras 2013. We have one just like it. And, thus, another commonality among all New Orleanians. The smallest thing can make you feel just right at home, y’all. It’s hard to feel out of place when you see proof that you were all at the same parade on Mardi Gras Day, even well before you met. I’m a little worried, though. If our cabinet is in such a state already, how is it going to be after next Mardi Gras? And the next? It’s not just the quantity you have to worry about. It’s the SHAPES. Short stack with short, tall stack only with tall. And then there are those weird and gawky littlest ones that don’t fit with anyone else. OH MY GAWD, WHERE WILL WE PUT THEM ALL?!?! OH, THE HUMANITY! I mean, I’M DRINKING FROM ONE RIGHT NOW. I NEED HELP. Note: Tonight’s cup-o-wine brought to you by the Krewe of Carrollton, 2014. Because my holographic Nyx cup is in the wash.
Yup, I understand it, and certify to how important they are. Just saw one in use on your coffee table last Saturday. The only thing you can do about the collection is get a bigger house. That’s what I’m facing with all these books I keep collecting. I don’t know why I do it, I already have enough to read to last for 1000 years, but I do it. That’s just the way it is. You just gotta have ’em! And cups, and footballs, and beads in a huge crystal vase, and…. Yessir! On the coffee table and the porch table and the kitchen counter and the coffee table and and and. HA! And it’s true! The things we collect! 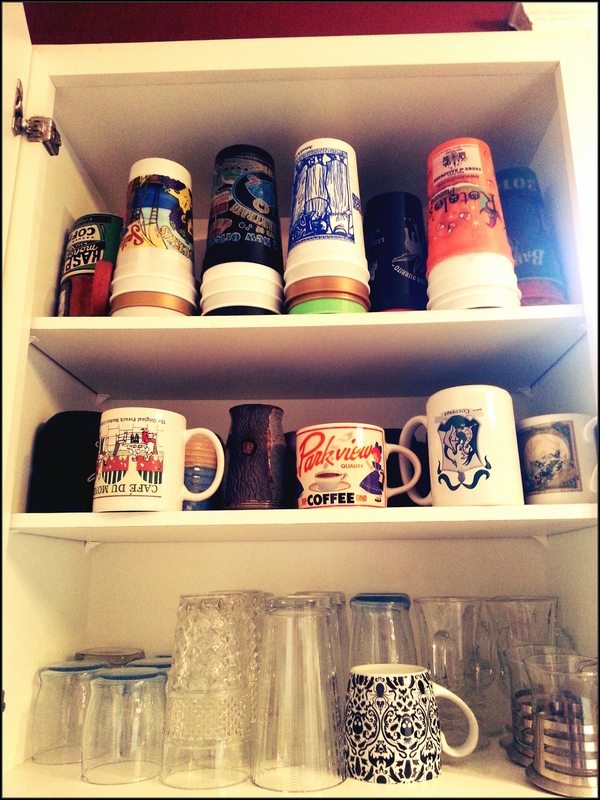 And isn’t it funny how a goodly sum of those glasses found their way into our cabinets? I actually have one of the glow in the dark glasses on my night stand in the bedroom. When I shut off my lamp at night there is always a soft glow in the room. Well, yeah! Gotta share the booty! The glow-in-the-dark ones are in my top 5 favorites. LOL! I know a nice lady with blonde hair and big eyes and a wide red smile who used to live a whole mile up from the sea, and this is a problem she’d have been be grateful to have a few years back.